In the Combat Phase, battles are resolved. A battle will take place if a hex is occupied by more than one party (a party being either a player, the Ancients or the GCDS). 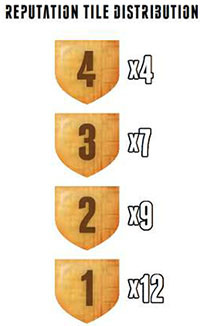 If there is a battle in more than one hex, the battles are resolved in descending numerical order of the hexes (printed on one corner of each hex). The Center hex has the lowest number and will thus always be resolved last. If a hex contains more than two parties, battles are first resolved among the players' Ships with the sole surviving player then engaging the Ancients or the GCDS in battle. 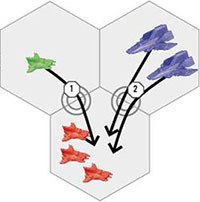 If the hex contains more than two players' Ships, battles between players are resolved two players at a time, in reverse order of entry into the hex. Therefore, the two players who last entered the hex will battle each other first and the surviving player will then battle the player who entered before the two. The survivor of that battle will fight the next player in reverse order of entry and so forth. The last surviving player will battle the Ancients, if any. Example: The Red player is already in the hex. Green moves there first, and then Blue. Green and Blue will battle first, and Red will then battle the survivor. If the hex already has an Influence Disc and is thus controlled by a player, that player is always considered the defender and will fight last regardless of the entry order, even if his Ships actually moved there last. 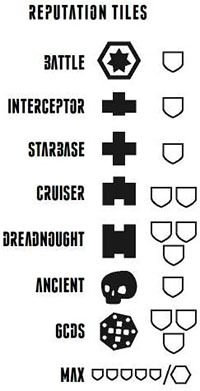 Each Ship type (Interceptor, Cruiser..). of each player are activated in Initiative order. The Ship type with the highest Initiative goes first. All Initiative ties are resolved in the defender's favor. The defender is always the player who has an Influence Disc on the hex. In the case of a hex with no disc, or a hex with more than two players, the defender is the player who moved there first. 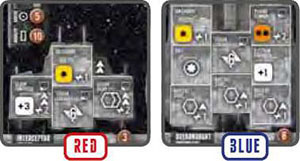 Example: The Red Interceptor's Initiative is 6: 2 for the Ship's default Initiative, +2 for the Computer and +2 for the Drive. The Blue Dreadnought's Initiative is 3: 0 for the Ship's default Initiative +1 +1 +1 for the three Drives. Ship's blueprint, you are allowed to roll one die of the corresponding color. The dice of different colors allow you to roll for all the weapons in your Ships of the same type simultaneously. After rolling, you choose which enemy Ship you assign each die to (see combat example on pages 22-23). 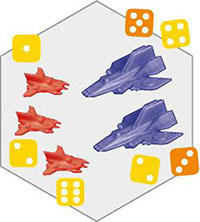 Several dice may be assigned to the same target. 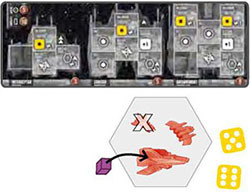 Example: The Red player would roll three yellow dice, one for the Ion Cannon on each of his Interceptors. Blue would roll two yellow dice and two orange dice. Rolling a 6 is always a hit and rolling an 1 is always a miss, regardless of any bonuses the Ships may have. For other die results, add the value of your Computers to the die roll and subtract the value of the target's Shields. If you end up with a value equal or greater to 6, the die is a hit. Different weapons do a different amount of damage when they hit. Ion Cannon (yellow die) inflicts 1 damage, Plasma Cannon and Plasma Missile (orange die) 2 damage and Antimatter Cannon (red die) 4 damage. The amount of damage a weapon inflicts is presented by star symbols on the weapon tile. By default, one point of damage will destroy a Ship. Each Hull symbol on Ship Parts will absorb one point of damage. So, if a Ship has two Improved Hull parts, it will be destroyed by the fifth point of damage. Damage from one die (eg. Plasma or Antimatter Cannons) may not be split to several targets. If a Ship sustains damage but is not destroyed, mark the damage by placing Damage Cubes next to the Ship. One of the other players rolls the dice for the Ancients and the GCDS. If possible, the dice are assigned so that your Ship(s) are destroyed, the largest possible first. If no Ships can be destroyed, the dice should be assigned to inflict as much damage to your Ships as possible, the largest possible first. Example: The Ancients rolled 5 and 6, which means two hits. The Interceptor is the only one that can be destroyed, so one of the dice is assigned to it. The other one is assigned to the largest possible one, in this case the Dreadnought. 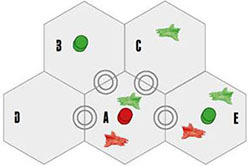 Every battle begins with Ships firing their Missiles (if any) once and continues with repeated Engagement rounds until only one of the sides remains in the hex. 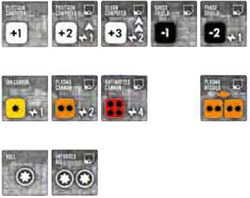 All Ship types of each player equipped with Missiles fire their Missiles in Initiative order. You roll two orange dice for each Plasma Missile Ship Part. Each Ship type of each player is activated in Initiative order. Each of your Ship types may on its turn decide to either attack or retreat. The Engagement round is repeated until one of the sides has been completely removed from the hex. Then the players return the destroyed Ships to their owners. When you decide to retreat your Ships, move them to the edge of a neighboring hex to show that they are retreating. The hex to which you retreat must contain your Influence Disc and must not contain enemy Ships. The normal Wormhole movement rules must be followed (see the example on the right). If you have the Wormhole Generator Technology, you may retreat through a hex edge that has a Wormhole on just one side. Example: The Green Interceptor decides to retreat from hex A. It may retreat to hex B (only his own disc) but not to C (only his own Ship), D (empty) or E (contains an enemy Ship). Red cannot retreat anywhere. While the ships are on the edge of the hex, they are retreating and can still be shot at. The next time it is the retreating Ships' turn, all of them must move to the neighboring hex. They have now fully retreated and can no longer be shot at. If a battle ends in a situation where it's not possible for either player to destroy the other (this may only happen when none of the Ships in a battle are armed with a cannon), the attacker may retreat (following the requirements for the hex he is retreating to). If not, his Ships are destroyed. After all battles have been resolved, the remaining Ships may attack the population in the hex. Each Ship may attack once with all of its Cannons (Missiles may not be used), using the normal rules to hit. Population is considered not to have any shields. Each point of damage destroys one Population Cube of your choosing. If you have the Neutron Bombs Technology, you may destroy all the Population Cubes from the hex without rolling any dice. Destroyed cubes are returned to the defeated player's Graveyards of the corresponding color. The cubes are returned to their respective Population Tracks in Cleanup Phase. If a cube is destroyed from a gray (wild) square, the owner may choose which Graveyard it goes to. Similarly, if a cube is returned from an Orbital, you may return it to either the Money or Science Track. Destroying Population Cubes does not grant Reputation Tiles. Orbitals and Monoliths may not be attacked, nor are they ever removed from the hex. The population on the Orbital must be destroyed the same way as the other Population Cubes. You may not draw more than five tiles. Choose one of the tiles and place it face down on your Reputation Track. Put the rest of the tiles back in the bag. If the track is full, you may return any of your Reputation Tiles (including the one you just drew or one from the track) in the bag. The tiles are drawn in the order the players entered the hex, so that the player who first entered the hex will draw all his tiles first. If all of your remaining Ships retreat from the hex, you get no Reputation Tiles for taking part in the battle, but you still get tiles from destroyed enemy Ships. At the end of the Combat Phase, if you have at least one Ship in a hex that has no population, remove the previous controller's Influence Disc (returning it to his Influence Track). After this, you may place your own Influence Disc there. Also, if at the end of the Combat Phase your Ship is in a hex without an Influence Disc, you may place a disc there. At the end of the Combat Phase, all the Damage Cubes are removed from the Ships. In the unlikely event that you lose all of your Influence Discs and Ships from the game board, you may no longer place Influence Discs on hexes. You may continue to produce Resources each round (note that you will have some production even if you do not have any Population Cubes on the board) and take Research actions, which may still grant a few Victory Points. It is very unlikely that your score will be high, as just the hexes will often grant you over 10 Victory Points. You may also give up the game, counting your score and returning all your game components to the game box.